Between 1924 and 1936, Austrian-born architect Josef Frank built five holiday homes on the Falsterbo Peninsula in southern Sweden. Conceived as summer houses for friends and relatives of Frank’s Swedish wife, the Falsterbo Villas constitute a key part of Frank’s architectural work and demonstrate concerns at the core of his housing designs. In 2016, Villa Carlsten, the smallest of the Falsterbo houses, underwent an extensive restoration. Published on the occasion of its completion, Josef Frank—Villa Carlsten is the first book to comprehensively document the building. As with all of Frank’s housing designs, Villa Carlsten sees the architect paying special attention to the connection between interior and exterior, to the availability of daylight, and to inhabitants’ movements throughout the building. A particular part of Villa Carlsten’s charm is its scale, as everything is of slightly smaller dimensions than one would expect. Despite its intricate layout, however, Villa Carlsten is also one of Frank’s most accessible homes, and the design is full of wit, combining comfort with modern refinement. 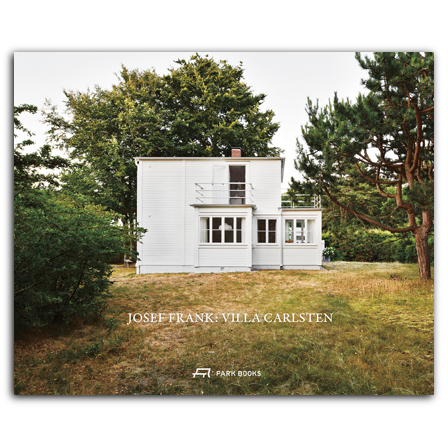 Beautifully designed with seventy-five full-color photographs by Mikael Olsson, who adeptly highlights the home’s qualities and relationship with its surroundings, the book also includes an essay by Michael Bergquist, who realized the renovation and places Villa Carlsten in context with the other Falsterbo Villas and Frank’s broader work. leitet in Stockholm sein eigenes Architekturbüro. Er schreibt regelmässig über Architektur und veröffentlichte einige Bücher über Josef Frank. Bergquist wurde mit der Renovation der Villa Carlsten in Falsterbo, Schweden, 2016–18 betraut.